Ta–daaa! Finally, here's the secret you've been waiting for so long! Can you imagine life without supermarkets? Well, I definitely can't :) But I can imagine how time–consuming it was to visit so many stores in so many locations to get the basic stuff for your household (and sometimes get back home with only half of things you need). Making your website Search Engine friendly may be just the same way time–consuming and boring, when you have to get to dozens of resources, collect the necessary data manually and update it each time you change something. And this is just the basic stuff, imagine how complicated your SEO routine will get when your site will grow and you'll have more and more tasks added to your daily to–do SEO list. you get access to my favorite tool, WebSite Auditor, that very quickly and professionally performs all the tasks I've described, and much more! You can download it free of charge at http://www.link–assistant.com/website–auditor/download.html. Let's take a closer look at how it works and which data it serves. To create a new project for your website, click "New". After that all you need is type in your domain URL and the tool will give you the most comprehensive review of your website. Good news, you can pick the parameters you are most interested in (e.g., broken URLs, content type, etc.) or select all and get the whole picture at once. In a couple of minutes, in the left hand coulmn you will get a list of all your pages, to the right you will see the data in accordance with the factors you previously marked. Why not sort your results by "Broken links" for example? You will see which pages need your attention in the first place. Uh–oh, it looks like I have some work to do today! Broken links. If search spiders can find their way around your site, they can index it, and then your site will get more pageviews. But if links are broken, a spider can't follow them. 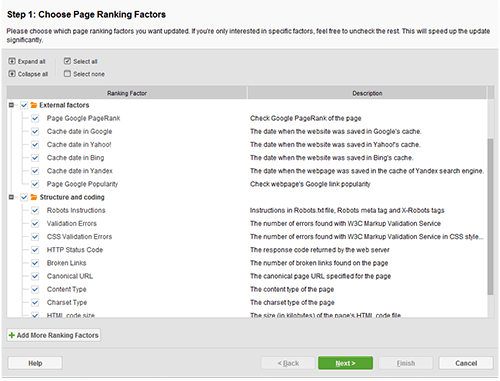 Isn't that great that WebSite Auditor quickly detects all the broken links to let you fix them later. HTML code errors. Search Engines will ignore most mistakes in HTML code, but there are some that they cannot and will not ignore, and if you have them, your site may not necessarily receive a "penalty" from a Search Engine, but you will see Search Engine rankings that are lower than you would otherwise receive for your site. As WebSite Auditor displays your code errors, you'll be able to fix them in an eye blink. Duplicate content. If there are pages with similar content, a crawler may not be able to determine which of them is more relevant for a particular search query, and which one should rank. To help you avoid such bottlenecks, there's WebSite Auditor which provides you with a list of duplicate TITLE tags which may not tell the whole story, but are a good starting point. Not indexed webpages. If a page is not indexed, it will not have any pageviews. That's why WebSite Auditor lets you indicate such pages and take action. Missing or too long TITLE tags and Meta Descriptions — Google shows 65–70 characters for page title, and about 150–160 — for Meta Description. So, if these tags are not filled in or are too long, they may be truncated and thus will look sloppy and uninviting to users. No worries though. WebSite Auditor will help you fill in these tags so that they are displayed properly. And what about sitemaps? Is WebSite Auditor any good at working with them? You've just read my thoughts! 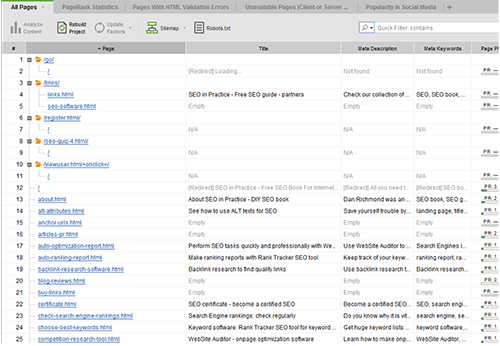 Before you create a sitemap, WebSite Auditor thoroughly analyzes your website pages, checks the parameters you selected, and shows you what to fix. After this check is done you can select pages to include in your website sitemap, which means that you can select flawless pages first and add others later, as you fix all the indicated problems. Isn't that nice? Well, what's even nicer is the tool's ability to automatically upload your sitemap via ftp, which adds to WebSite Auditor convenience. The process of creating a sitemap is user–friendly and doesn't require special knowledge. Under the "Website" tab, you should click the button "Sitemap," choose the pages you want to be included, and then either save the sitemap locally or upload it to your server via ftp. Hope you are already excited to test it. Initially I face so many problem whenever I want to get the data and links but now with this way you solve a biggest problem.